Let’s talk french presses. A lot of separate questions come up when dealing with these occasionally delicate, but extremely useful coffee makers. They’re one of the simplest, easiest ways to make coffee, and Bodum stands amongst the highest quality presses on the market. However, if you’ve ever wondered whether your Bodum french press is dishwasher or microwave safe, this article will cover all this from Arabica to Z.
So… can you put Bodum french presses in the microwave? What about the dishwasher? Which parts are safe for these machines, and which should be hand-washed? Are there any other precautions you should take to preserve these high quality coffee makers? And before you do, if you’re not completely convinced as to why you’d want a french press in the first place, or whether drip coffee is the way to go, it all depends on your preference. Our article here covers all the differences, the unique benefits, and why you’d want to go with one method over another. Additionally, if you’re just coming back from that post and are fully convinced about the highly convenient french press method, you’re welcome to navigate to this page here, revealing the most efficient (and dishwasher-safe) press on the market, for the money. And finally, a step further if you’re a french-press lover, you should consider picking up a dedicated coffee grinder for it, so the grounds are small enough to make the most aromatic and flavor-packed cup of caffeinated joe you can get. This post is our run down of the best manual french press grinders on the market today. What Are Bodum French Presses Made Out Of? This question is a great place to start before you think about using any machine or process less delicate than your hands to clean your french press. Part of the reason that the Bodum line is the top tier when it comes to preparing high quality, filtered coffee (that preserves the wide gamut of flavor profiles) is the separate parts that make up the gestalt of their products. It’s primarily made up of different glasses and plastics for its specific uses together. Santoprene – A silicone coating used in various product elements. It provides a non-slip grip that hugs the outside liner of the french press handle, remaining cool to the touch. This ensures that no one gets burned by the scalding water inside, but you should still be careful when handling your press. S.A.C. (Styrene-Actylnitrile-Copolymeride) Plastic – A highly transparent, scratch-resistant plastic that doesn’t deform from heat and is also resistant to temperature change. It’s BPA-free and dishwasher safe material in and of itself. As to whether the whole thing (or its parts) can be washed with your home appliances, read on; we’ll reveal that in a moment. P.P (Polypropylene) Plastic – An equally tough, unrivaled plastic known for its hardness; it doesn’t deform from high heat or the rapid transition between hot and cold. This specific plastic is also BPA-free and dishwasher safe. P.O.M. (Polyoxymethylene) Plastic – A rigidly firm plastic that ironically has a great elasticity, is BPA-free and dishwasher safe too. Can you clean your Bodum french press in it? Can I Wash My Bodum French Press in the Dishwasher? The short answer is yes; each of the five unique materials in your Bodum press are made up of safe-to-use items for the dishwasher. The water in your machine shouldn’t ever get hot enough to melt the plastic, and (if you’ve placed everything carefully) the glass shouldn’t break either. Usually there’s a top and a bottom rack to dishwashers; try and put the glass beaker where the heat is highest, and the plastic pieces where the heat will be the most mild. Bottom line: you can wash your Bodum in the dishwasher, but you’ve got to remember to properly dispose of the grinds in a way that won’t ruin your drain, septic system, or kitchen plumbing. You’ll also want a clean french press screen after making your last brew, though that should also be carefully cleaned out in the trash or some other location too. You don’t want any grounds going down the drain, ideally. Now, hopefully that was helpful in thinking about whether you can or should wash your Bodum in the dishwasher, but what about using the microwave to heat up old coffee brews? Can I Microwave My Bodum French Press? First of all, it doesn’t make much sense to microwave the coffee you’ve got in your french press to heat it up. Usually pouring boiling water in over your freshly ground, high-quality coffee beans is the way to go, and you do it once. One and done. 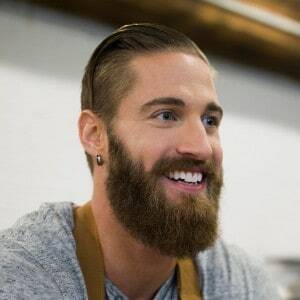 However, microwaving the coffee is the best way to make it overly bitter and shocking to your tastebuds. As we mentioned, the beaker with the separate materials blended (like Borosilicate and Santoprene coatings) is great for withstanding high temperatures, and even rapid changes in those temperatures. All of these qualities make it a fantastic candidate to use in the microwave. Removing the beaker from the plastic handle would be the first step in the process, as you wouldn’t want to melt your handle or plastic coatings surrounding the plunger. That’d be both dangerous and highly inconvenient. You also never want to put metal in the microwave (like the plunger pieces) as it could spark and start a fire. So, if you can remove the beaker to heat up your coffee, and it stands up while revolving in the microwave, that’s a risk you’re welcome to take. However, remember when you go to remove it, it’ll also be scalding hot, so you’ll want to use gloves or panhandle mitts of some sort. Another dangerous possibility is when the water is definitely at or past boiling temperature, but bubbles aren’t coming up to the surface to indicate boiling. In this case, the water is boiling, but the container it’s in isn’t representing that fact. There’s no reason to heat the water for coffee past its boiling point. If you’re the type that likes a quick brew from boiling water, you’ll still need to watch out for superheating if you’re using a microwave. As a final note, a cool trick we’ve found here at GBC is that putting a popsicle stick in the beaker (while in the microwave) provides a rough surface for the water to use to form bubbles, preventing any dangerous spillovers of hot water. Try this out when you’re staying safe, boiling the water in your Bodum. Keep in mind that these Bodum product lines are made very well… but they’re not perfect. Nothing made out of glass is invincible, and people have made boiling coffee, then dropped ice cubes inside, cracking the glass from sudden changes in temperature. It should be able to withstand hot temperature use within reason, but pushing it past its limits is a guaranteed way to break stuff and waste money! Also, there’ve been cases where people break them in the dishwasher or have problems when putting them in the microwave because of the extreme temperatures. So in this regard, you’ll want to exercise common sense and good judgment. Past this, if some accident does indeed happen to your Bodum, they’ve got options for sale including the most relevant and likely replacement parts needed. You can check out different beakers and replacement parts here. If you click their brand name on the Amazon listing, you’ll be able to check out many of their other products too. Some of their coffee makers are 34 ounces or one liter etc. because some extreme coffee makers and lovers want to opt for the bigger options. Alternatively, if you’ve got a big family, and it’s coffee time the same time every day, you might want to opt for a bigger french press from Bodum as well. 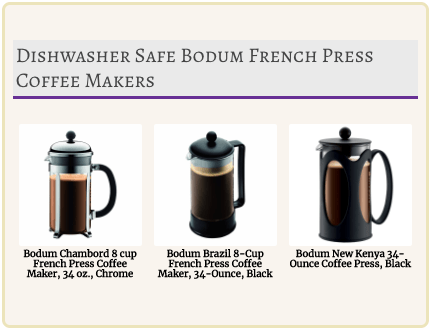 Now we’ve covered all the options for french presses, (specifically from Bodum) that should be carefully considered when using these machines. It’s wise to take care and use good judgment when using the microwave especially, for your personal safety. But using a dishwasher with your Bodum is also usually no problem, provided you do it right. Start your Bodum french press journey and experience the best coffee makers compared, by navigating over to this link. Enjoy your coffee and brew one for us. ← Pour Over Coffee vs Stovetop Espresso: Which is Better & Whats the Difference Anyway?